Moving into a new home should be an exciting time, but that doesn’t mean that it’s all fun and games. Before moving day, before unpacking all the boxes and before unloading all of your stuff, you’ll want to make sure that you give your new home a good cleaning. There are lots of reasons why you need to give your new home a thorough once-over. For one thing, cleaning it before moving in will make it easier to do a good job since there’ll be no clutter to contend with. 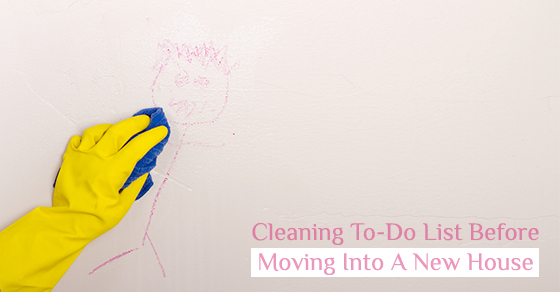 So check out this ultimate cleaning to-do list before moving to a new house. You’ll be glad you did! You’ll want to give the kitchen a good cleaning. That means disinfecting the surfaces, wiping down the cabinetry, washing the floor and deodorizing. You and your family will spend plenty of time in the kitchen, so that might be the first place to start when cleaning your new house. Whether it’s the stove, fridge, freezer or other things, you’ll want to pay special attention to appliances. Get appropriate cleaners and enough rags or sponges to do the job right. When working on the stove, remove any parts that can be removed like the elements and carefully clean everything methodically. Don’t forget the oven portion. Get a good oven cleaner and give the oven a good scrubbing before using it. Also, move the stove and clean beneath it and the sides of the stove as well. After you’ve done the stove, you’ll want to turn your attention to the fridge. Remove the fridge to clean the sides and the floor beneath it. Remove the storage bins and drawers, and give everything a good washing. Warm water, soap and a sponge or rag will do the trick. You can then move on to the freezer. Clean it inside and outside. As with the stove and fridge, pull it out of its place to clean the sides and the floor under it. It’s also important to clean the walls. A quick look at the state of the walls will give you some indication as to how much effort they will require. If they were painted very recently, you may not have to clean them at all. If your walls are particularly grimy, one trick is to apply a little bit of fabric softener and rub the soiled area. If your walls need cleaning, first get rid of things like cobwebs and dust, clean the baseboards and moulding, and wipe the doorframes and switch plates. Clean the flooring thoroughly. If you have carpets, you can hire a company to clean them or you can rent a commercial rug-cleaning machine. You can use steam cleaners on hardwood, laminate and ceramic tiles, or you can use a mop and soapy water to clean such surfaces. Give the washroom a good cleaning from top to bottom. That means scrubbing the tub, the floor, the toilet and the sink. If you properly clean your house before moving in, you’ll be able to settle in and enjoy your new home sooner rather than later. So make a list of what needs to get done, roll up your sleeves and get to work.